By making money available through these programs, the Fund supports local businesses and creates jobs across the state. With the In-State Program, the Fund looks for companies in need of expansion capital. Businesses use the Fund’s investment to expand their operations and hire workers. The Fund has invested $820 million in over 300 New York businesses, with almost $325 million returned on exited investments. The companies in the In-State Program have also created or kept more than 4,500 jobs around the state. The Fund works with NYBDC to provide loans to small businesses in New York. These loans help small businesses buy property and equipment, expand, or start up. They also help create or retain almost 9,000 jobs each year. By borrowing from NYBDC, small businesses can receive lending terms that are often more favorable than other lending terms. Since the Fund partnered with NYBDC, they’ve loaned $362 million to 1,082 small businesses. Since teaming up with New York Business Development Corporation in 2007 to offer small business loans to returning military veterans, the New York State Common Retirement Fund has made nearly $1.5 million in loans to military veterans. 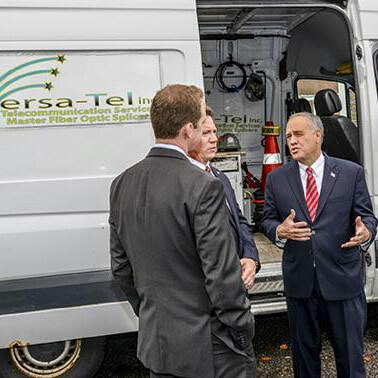 On Veterans Day, Comptroller DiNapoli visited Versa-Tel, a veteran-owned telecommunications company based in Long Island, which received one of those loans. Last week, State Comptroller DiNapoli introduced a program that will make $200 million available for in-state investing. The SBIC fund offers credit financing to eligible New York companies, which provides another way to help smaller businesses expand their operations. The Fund is one of the first public funds to offer state-focused credit financing. The Fund has New York’s best interests in mind by investing in local businesses and the result is two-fold: New York businesses receive the financing they need to succeed, and the Fund receives solid returns that get passed on to its members and retirees. Content last revised November 19, 2015. This entry was posted in General News, Pension Fund and tagged Comptroller Thomas P. DiNapoli, In-State Private Equity Investment Program, Information is the Key, Invested in New York, Jobs, local business, New York Credit Small Business Investment Company, New York State & Local Retirement System, New York State Common Retirement Fund, NYBDC, NYSLRS, One of America's Largest Pension Systems, SBIC, Strength Through Strategy, Strong New York, The New York Business Development Corporation, this public pension system works, Veteran's Loan Program, well funded on November 19, 2015 by NYSLRS. The ONLY matter that the NYS Retirement System should be concerned with is investment practices that assure funds will be available to pay it’s annuitants now and in the future and to assure the continued stability of the fund. Other considerations (investing in NYS enterprises, investing in “green enterprises”) are irrelevant and distract from the System’s main (and I believe sole) obligation. Thank you for sharing your perspective and concerns with us. Please be assured that first and foremost, pension fund dollars are invested to generate a return for the pension fund and to protect the best interests of the members. What states are #1, and #2? The two largest public pension funds in the United States are both in California. The California Public Employees Retirement System (CalPERS) ranks first in the country, followed by the California Teachers Retirement System (CalSTRS). you should not be using my money to pick winners and losers. Thank you for sharing your thoughts with us. Please note our pension fund investment response to Cats01. I agree with the others and will piggyback by saying the pension fund is intrinsically tied to the New York economy and by intentionally weighing the pension investments to the New York economy when the fund should be diversifying its exposure is I believe contrary to the fiduciary responsibility of the Pension Fund Trustees. This compounded by the Funds Trustees permitting upstate localities which are financially under rated or just plain unrated to skip their pension payment obligations is in my opinion a breach of the trustees fiduciary responsibilities and being done for solely political reasons. H.R. McCall would never had permitted this and I felt much safer under his watch. Thank you for sharing your concerns with us. As stated previously, it is Comptroller DiNapoli’s top priority that pension fund dollars be invested to generate a return for the pension fund and protect the best interests of NYSLRS members. Investments in New York State, like all others, are selected with that criteria in mind. Then please explain to us how it is in the funds interest to allow upstate municipalities that are struggling to meet their current pension obligations today to defer them and to somehow naively believe that they will in the future be able to pay back both their current and back pension obligations. Comptroller Dinapolli is allowing these UNRATED and UNDERRATED municipalities to amass year after year of unfunded obligations with no end to this practice in sight. As I stated before you cannot convince me this is somehow in the funds best interest. Can anybody say Puerto Rico ? The Amortization program was adopted at a time when the market had collapsed and rates had substantially increased. As the state was discussing multiple ways to reduce benefits to state employees, we proposed a plan to help employers mitigation the higher costs. It is not an option that we recommend that municipalities partake. They should always pay their bill in full. But rates had increased so substantially that our challenge was to provide an option that was responsible, conservative and did not hurt the funding status or the long-term health of the fund. We are happy to have someone call you on this issue, if you wish. Then WHY is this deferral being allowed to continue unabated if it was enacted “when the market had collapsed” ? WHY when there was there a $5 Billion surplus in the state’s budget was this surplus diverted into the pension fund where it would have had immediately increased the funding of the plan and therefore immediately lowered the amount of pension contribution required for everyone in the state. That would have been sound relief. You say you do not recommend these upstate municipalities utilize this amortization option but yet The Comptroller enacted it and allows them to year after year continue down this path of compounded unsecured pension obligation debt. Please also do not insult the intelligence of the participants of the fund whom one day will rely on its solvency by stating this not hurt the funding status or the long-term health of the fund when you allow these underrated and unrated municipalities to issue IOU’s in lieu of there actuarial required obligation. We are not ignorant. For the sake of The Pension Fund , the beneficiaries of the fund , and the State of New York itself can we please end this practice in 2016 before we dig a hole that we cannot climb out from if we have not already. Please give this some thought. Thank you for your thoughtful comments on this topic.